In the early hours of this morning Sikh Relief senior representative, RP Singh, was arrested from his home for no apparent reason other than making a statement to the press against the Akal Takht decision to pardon the criminal cult leader Ram Rahim..
During yesterday’s united protest in Amritsar against the pardon, RP Singh said the Jathedar did not act with the Sikh nation’s best interests at heart, but rather with the political gains for Badal Dal being at it’s core. The nation can never accept such a decision. 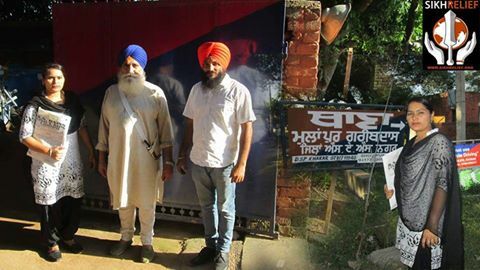 As soon as our team learned of the early morning raid on Bhai RP Singh’s home, Parminder Singh Amloh together with Advocate Kulwinder Kaur in the role of RP Singh’s legal brief, arrived at Mulapur Garibdas police station. Due to a complete lack of any credible evidence against RP Singh the police were compelled to release him. CM orders Inquiry :- Police Entered In Assam Gurudwara with Shoes on and Carrying Weapons.